The First Cut: Pisces, Aquarius, Capricorn & Jones Ltd.
1. It was impossible to to imagine Debbie Carney as a fan of The Monkees. She was too cool. 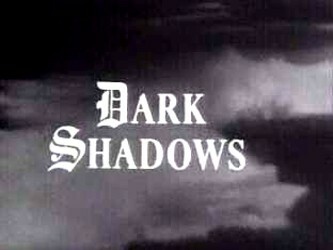 So cool that she ran home from school as fast as she could just to catch the last half-hour of Dark Shadows. So odd that she drank iced pickle juice at the movie theater when she went to watch horror/sci-fi double features. So against the grain that in the not-so-secretly racist 1950’s Tulsa, she did her best to befriend the neighborhood black kid, something most white girls simply would not do. Her musical tastes included poor role models like Janis Joplin. She was totally cool. And, as “fake” as I thought they were, she loved The Monkees. A lot. Perhaps because it was more mainstream than her other interests, or maybe in hopes that her love of something so popular might break her out of her shell, her mother made sure she got to watch the tv shows, got to buy the new albums at the record store on Yale Ave as soon as they came out, and got to buy all the Tiger Beats and associated rags that featured them. Those magazines went with her everywhere she went, in a paper grocery sack. Everywhere. She didn’t go many places, though. She mainly kept to herself. She would describe herself now, as cool as I think she was, as a lonely little fat girl who preferred horror movies and making collages from Life and Rolling Stone magazines than friends. Introverted enough that in 1969 her social insulation caused her to have a nervous breakdown; she became ill right as she had moved to Arkansas and started a new school, and when she was well enough to return to school her only friend had dared to make moved away. Lonely enough to make brave, drastic changes to make her life better. 2. Debbie Carney grew up to be my mother. And as I grew up to be her son, my life started to parallel hers. I had several nervous breakdowns of my own(most of you reading this are nodding your heads right now), and the biggest were centered around alienation from my college friends who I had nervously invested in tons of emotional support, and my mother’s illness, a neuromuscular disease with no clear diagnosis. But unlike my mother, I was able to strengthen my friendships with the weird quirks that I had. Also unlike my mother, I had no idea that The Monkees were cool. Their identity had been thoroughly entrenched in the “fake” camp by whatever forces molded my opinions then. Even though the albums sat along with the others I would wear out as a kid, The Monkees didn’t get any play. 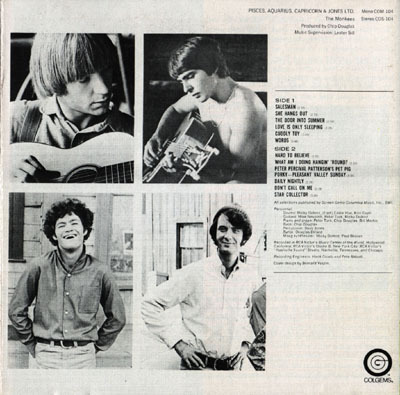 I had started on a listening and interest path the The Monkees would never have reason to be on. Imagine my surprise when, after the most important bonding ritual with my friends on campus, The Sharing Of Music, baring myself naked with my love of hip-hop and being embraced on the other side, getting out our kicks with The Big Four (Trout Mask Replica, Disco Volante, We’re Only In It For The Money, and Captain Beyond), everyone else freely admits that The Monkees are awesome and I didn’t. I kind of felt like an idiot. I had started to love and respect my friends too much to not believe them, and they helped me find out the truth. -Songs written by A-List song writers, including Coffin and King, Harry Nilsson, and Michael Martin Murphy. -The first use of a Moog Synthesizer in a commercial music record; one that Mickey Dolenz owned himself and bought when the first ten produced were for sale. -Michael Nesmith nailing a a tricky set of versus in seven on “Love Is Only Sleeping”, right after surgery. -Davy Jones, dreamy pinup pop superstar, singing a song about gang-banging teenagers(“Cuddly Toy”). -Davy Jones, dreamy pinup pop superstar, barely on the album(vocals on four of the album’s fourteen songs). Pisces… shows the band, after the overcompensating attempt at control they recorded on Headquarters, figuring out that maybe they didn’t have a lot in common; once they were released, musically, from the characters they protrayed on the TV show and they dealt with each other’s “realness”, things fell apart. 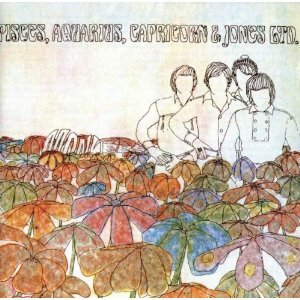 The sincerity of Pisces… wins out, thankfully, and is the best offering The Monkees would give, along with the most “real”. 4. I sat with my mother a few weeks ago and asked her questions regarding this essay. She and I are more alike than ever; we are both slow and aching as we walk, both can sit contently in the harsh realness of Levon Helm’s voice, both challenged by alternating wellness and illness, both as understanding of our own identities and each others. When I ask her about the “fakeness” or “realness” of The Monkees, she says it never really registered with her. She never cared what anyone else ever thought about the things she liked. It’s a lesson that took some courage for me to learn. Then I tell her about The Poster. In my first apartment, I had a poster on the wall. It was of a blind-contour drawing I had done of the back cover of Pisces, Aquarius, Capricorn & Jones Ltd., blown up to 3′ x 5′. You could easily make out the squinting, happy eyes of Mickey, the bauble on Michael’s ubiquitous stocking cap, the curves and lines of the guitar bodies and frets that Peter and Davy studiously stared at. My friends, the people that I love, all loved it. “I had no idea you liked The Monkees,” my mother said, and we talked some more. 5. In 1969, a young Debbie Carney took a grocery sack full of pictures of Davey, Mickey, Michael, and Peter, and burnt them to ash. Perhaps her new friends that she was making(the wonderfull Linda Hutchens and Alan Dunsworth, who I would know as Aunt and Uncle growing up) would understand her love of The Monkees, perhaps not, but mending her heart called for a fire-cleansed change. Although their albums were still around for me to listen to if I wanted, she would never push them on me. It took my own bravery to bring them back into our world. She has a grandson now, and I a nephew, who is too much like me; he loves her as I do, loves reading, and is infected with the spirit of music like it is the Pentacost. Even though I could easily use my influence, as could my mother, Pisces, Aquarius, Capricorn, & Jones Ltd. is a good enough album for him to find on his own, when the time is right. I hope he does.